It was 22 years ago, when the widow of Jacques Lipchitz, the renowned sculptor, had come for a private audience with the Lubavitcher Rebbe, shortly after her husband's sudden passing. As an artist and sculptor in her own right, she said that she would have liked to complete her husband's work, but, she told the Rebbe, she had been advised by Jewish leaders that the phoenix is a non-Jewish symbol. How could that be placed, in Jerusalem — no less! And then the Rebbe proceeded to explain to Mrs. Lipchitz the Midrashic commentary on this verse which describes the Chol as a bird that lives for a thousand years, then dies, and is later resurrected from its ashes. Mrs. Lipchitz was absolutely delighted and the project was completed soon thereafter. 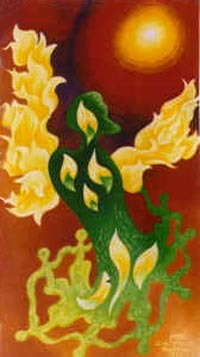 chol Chol is the hebrew name for the phoenix. Unlike for askenazi who have the Star of David, Sefardic jews from Portugal and Spain have the chol (=phoenix) who build its nest on a palmtree as a symbol of of victory over the inquisition. The chol is a bird that lives for a 1000 years, then dies and reincarnate from its ashes. So for spanish and portuguese jews it is a symbol of victory. I would like to send this story - don't know exactly for which reason - to my friend who has become, suddenly, a widow.